Our local in-town sewing/quilting group of 5-10 members, was asked to donate our skills and time to make another raffle quilt for RSVP - Retired Senior Volunteer Project. We settled on a Scrappy Friendship Star, each of us took home a piece of "focus" fabric so all the blocks blended. The Friendship Stars that came back were indeed, uhhhhh SCRAPPY!, and while we all HOPE they will blend nicely together, the great variety appeared scarey and possibly overwhelming - many of us were doubting! Possibly, you also have occasionally endured the same unsettling thought -- the "how can this ever turn out?" doubt. As soon as we started playing with borders, the quilt almost designed itself! Adding that ribbon border also gave it the almost-finished look we were hoping for. Lastly, the quilting, done by our friend Chell, absolutely took our project from "a Raffle Quilt" to "Stunning !" Wow - this is a lesson - finish your UFO quilts! Remember? "Quilting Makes the Quilt!" I'm including a link to her site - I'll bet you'll agree it's a lovely finish! (She has better photos, as well!) A binding and label will finish it. 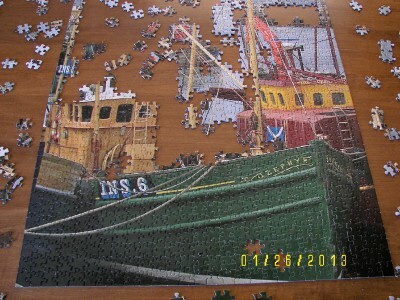 Notice the almost identical shapes of those all-blue sky pieces!!! I love the scrappy friendship star quilt! Some nice lessons learned there. Your raffle quilt came out so nice! I'm curious what the inspiration fabric was. That friendship star is wonderful! Everything came together beautifully. 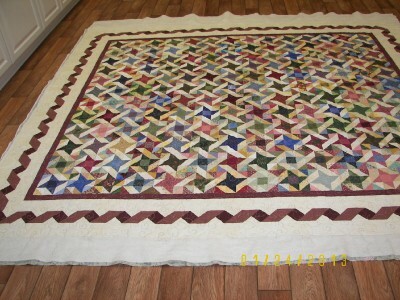 I love how scrap quilts do that, in spite of our fears to the contrary. What a super treatment of the friendship star! And I love the cocoa colored ribbon border, too. 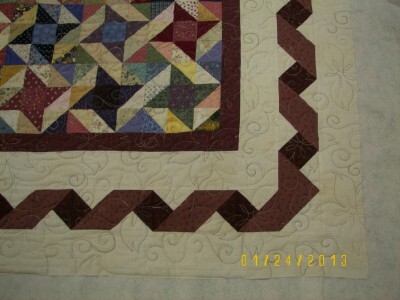 Thank you for including the quilter's link, she had close-ups of the quilting. So beautiful! This is really an inspiring quilt. I've got quite a few HST's made and this may be a great way to use them! The border is a nice border for this and I've got the instructions in my "someday" pile of print-outs! it turned out great! Now--I want to see a picture of the focus fabric. And loved the link to Chell--spent a lot of time wandering around there. Stay warm--we're getting blown off the map--I swear I had a window open in my sewing room (have a north window and we have a nasty north wind) I'm staying inside with my little heater and my electric blanket cranked up. The older I get the more I turn into a wuss. Your scrappy quilt turned out stunning with the ribbon border. 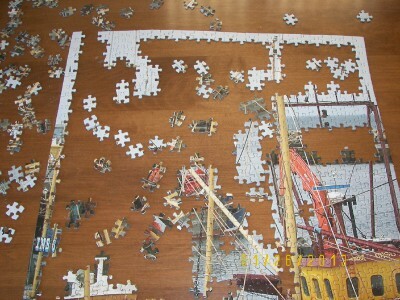 DH's puzzle is great, too. Thanks for the info on the website.